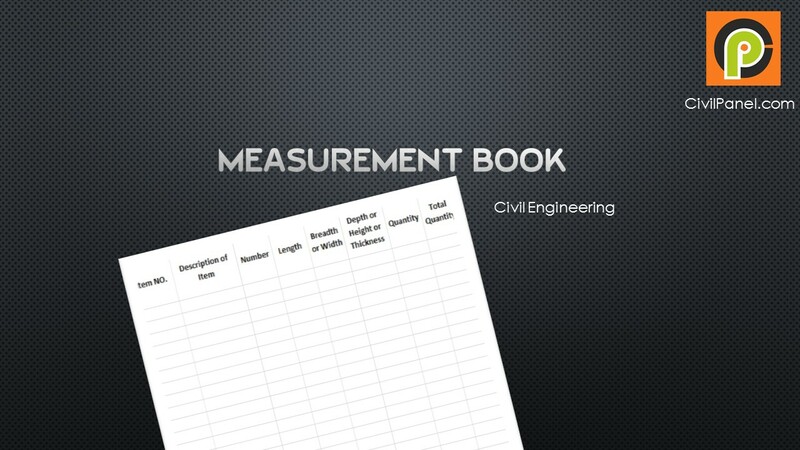 Measurement book in Civil engineering is a book used by any department or agency of construction site, to record the work done by the contractor with all the direction, dimension and quantity with date of execution of work. Measurement book is generally used by Junior Engineer or Assistant Engineer, who is responsible on the field or site of project. No record is entered in the measurement book by the designation below the junior engineer. Because the junior engineer is the starting designation or lowest level in the technical field. Civil engineering measurement is taken in the well manner format so that the checking of measurement done easily and properly by the senior engineer and accounting officer. Almost all the department having the same measurement book format which is shown below. First of all write down Date of Measurement taken. Item of BOQ (Bill of Quantity) is explained to understand that what is the measurement and from where it is taken. Serial Number of new measurement is written with Item number of BOQ as show in above table. Because it tell us the new record serial and from where same item is taken so that BOQ item serial number is useful for quick checking. Cubic metre or M3 or Cumec for volumetric measurement like excavation, concrete etc. Square metre or Sqm or M2 for areal measurement like plastering work which have fixed depth etc. metre or m for length measurement for standard or fixed width item like pipe line etc. The total quantity of measurement is calculated on same page, which is forwarded on Abstract book. Abstract book is the summary or index of measurement book. The data is acquired from measurement book, which includes the MB number, page number, total quantity and unit of quantity. If any other person than Junior Engineer writes in Measurement Book without permission of Junior Engineer and makes too much mistakes in writing . what kind of punishment can be imposed on such person. If someone wrote the wrong information in measurement,then junior engineer cancelled it immediately with their signature. Safety of Measurement book is sole responsibility of Engineer/Accountant. No record is checked if the record is not considered in abstract book.